Drama series set during World War I. Three women leave their old lives behind as they volunteer at a hospital in war-torn France. This is the challenge of their lives. 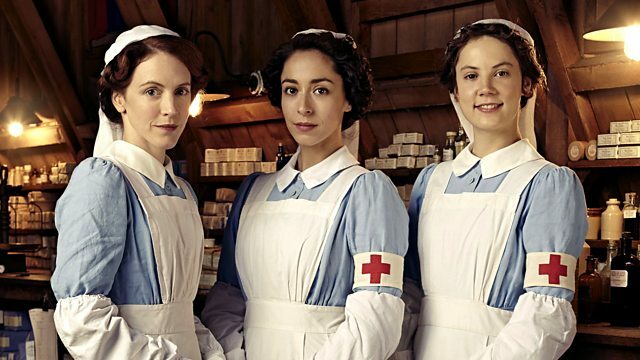 Drama series presenting one of the untold stories of World War I. Kitty Trevelyan tries to put past troubles behind her as she joins two other girls to volunteer at one of the busy war hospitals in northern France. For the hospital workers it is a daily battle to patch the men up and keep the war machine churning. Staff numbers are low and the volunteers are desperately needed, yet there are some who see these women as more of a threat than a lifeline. It is not just the girls who are causing a stir; one particular patient, a powerfully built and battle-scarred soldier called Molloy is facing certain death but resisting it with all the strength he can muster. Alongside him lies the shell-shocked form of Lance Corporal Prentiss. He may be physically unmarked, but this war has damaged him badly and the staff are at a loss as to how to treat him. The girls settle into their first day and it's soon clear that no training could ever have prepared them for the reality of working near the front line. As the day draws to an end secrets are hinted at, rivalries loom large and for the rebellious Kitty this new adventure could turn out to be very dangerous indeed.